There is a feature in my SharePoint URL Shortener solution that was not included in the video I posted on YouTube recently. I thought I would take the time to spotlight this feature because it may not be too obvious. 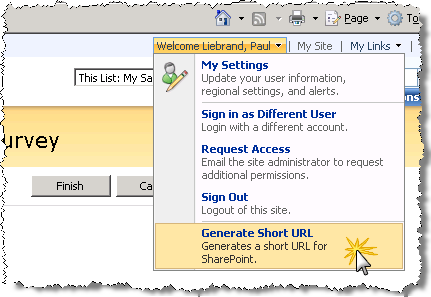 However, sometimes you may have the need to shorten the current URL you are on within a SharePoint site (it does not have to be a list item or document). My SharePoint URL Shortener adds a link to the Welcome menu located in the top right corner of the screen that when clicked will generate a short version of whatever URL you are currently viewing. Which will take you to some awful long URL which you would generally copy and paste into an email, or a SharePoint announcement and send out to your users. 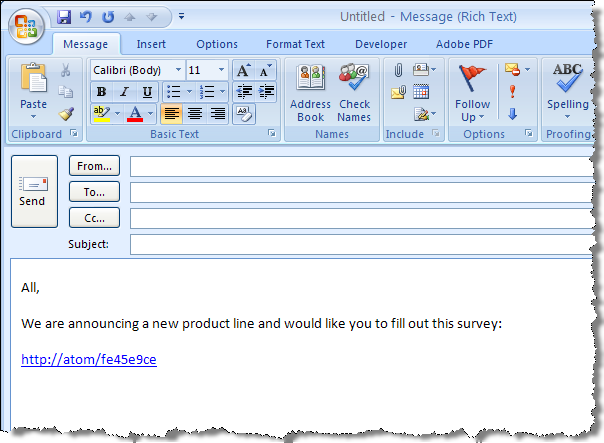 You can now include this shortened URL in an email message or post it to an announcement list within SharePoint. SharePoint URL Shortener Codeplex site has been published and is live! The SharePoint URL Shortener Codeplex site has been published and is now publically available (as promised from yesterdays post). As a reminder, the URL is http://spurlshortener.codeplex.com. If you have any problems, please post something on the Codeplex site and/or hit me up on Twitter (@PaulLiebrand). Thank you and please be gentle! 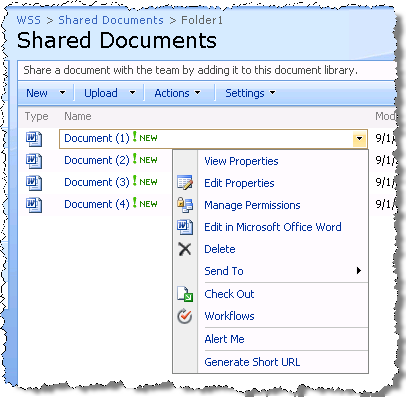 SharePoint Url Shortener – it’s finally here! After many iterations and delays I am pleased to announce that my SharePoint Url Shortener (initial version) is finally here! There is still some work to be done on this but I have decided to release it in its current state to start getting some feedback from the community. I’ll be publishing the Codeplex project sometime this weekend (probably Saturday) so be on the look out. The Codeplex Url is http://spurlshortener.codeplex.com – I’ll update my blog and send out a notification on Twitter (@PaulLiebrand) when I actually pull the trigger. Thank you for being patient and I hope you find this useful. My name is Paul Liebrand and I currently reside in Southern California. I plan on writing about anything related Microsoft SharePoint. Because of other interests I have , you may also see posts off topic here. I also started a community wiki site that will be dedicated to Windows SharePoint Services and related technologies. I update it has frequently as I can, but I encourage others to check it out and contribute where possible. The site can be found at http://www.wsswiki.com. You can also follow me on Twitter at http://twitter.com/PaulLiebrand. Hopefully you find the information here useful and valuable.